Jerusalem - Thousands of haredi men flocked to a mass election rally in Jerusalem to witness the historic meeting between the leaders of the hassidic and non-hassidic “Lithuanian” communities for the first time and to hear their leaders exhort them to “sanctify God’s name” by voting for United Torah Judaism (UTJ) on Tuesday. Rabbi Chaim Kanievsky, shlita, and the Gerrer Rebbe, and Rabbi Yaakov Aryeh Alter have lived for decades on the same street in Bnei Brak, but reportedly never met until Monday night on the podium at the UTJ rally. And alongside the historic moment came exhortations from leaders, hassidic and Lithuanian, to cast a ballot of UTJ to prevent what was portrayed as a looming catastrophe for the haredi community if Blue and White wins the election. 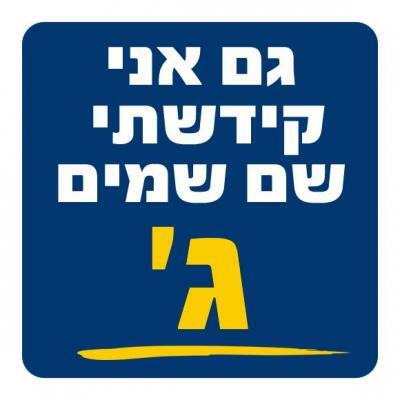 The shadowy demon at the heart of the dire warnings by the rabbis and politicians was, of course, Yair Lapid of the Blue and White Party, whose Yesh Atid faction cut so many of the various state benefits enjoyed by the haredi community in the 33rd government between 2013 and 2015. “Voting for UTJ is the only way to prevent what they intend to do to us,” warned party chairman and deputy health minister Ya’acov Litzman of the hassidic Agudat Yisrael party, one half of UTJ. MK Moshe Gafni – leader of Degel, the “Lithuanian” half of UTJ – went further, comparing the fateful hour to Yom Kippur, the Day of Atonement, by saying that the assembled masses were standing at the “locking of the Gates,” a reference to the final prayer service of Yom Kippur when the fates of men are sealed. “We are in the middle of a war over Shabbat, a war to ensure that the state will be a Jewish state,” Gafni declared. “We are in the middle of a war for yeshiva students, who the High Court could draft immediately after the election if we do not pass a law to prevent it,” he continued, in reference to the necessity for the haredi leadership of passing new legislation to grant mass exemptions to young haredi men from military service. Gafni said that most important of all was the need to pass a High Court override law which would prevent the court from striking down such legislation, saying that such legislation would be an invioable demand in its coalition agreement with the new government. Avraham, 18 years old from the prestigious Hebron Yeshiva, agreed whole heartedly with everything he heard. “I vote for the who the rabbis tell me. The decision isn’t mine, they decide and I fulfil the obligation of doing exactly as the rabbis say,” he said at the rally.